Located along the southern part of the Viking Trail in Gros Morne National Park in Newfoundland, Canada is the heritage building which is home to the Lobster Cove Lighthouse. The lighthouse has watched over these waters since 1892 which marks the marine approach to Rocky Harbour and the entrance to Bonne Bay. The Lobster Cove Lighthouse became automated in 1970, ending the jobs of the lighthouse keepers who resided in this heritage building. 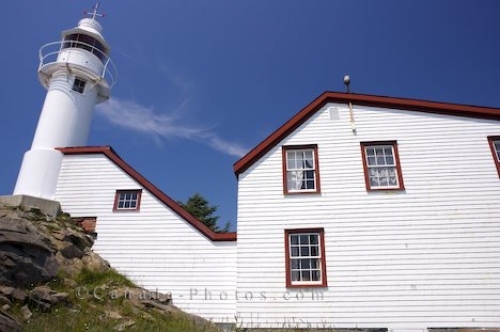 After the lighthouse became automated, the building was used by 2 artists who loved to paint the coastal scenery which surrounds this area of Newfoundland. Today, the heritage building is open to the public along with a park interpretative centre which helps tourists with the heritage of the building, the way of life along this coastal area and a display of artifacts, documents and photographs. A road leads to the Lobster Cove Lighthouse which is visibly marked along the way and the heritage building and the lighthouse can be seen from the highway. Picture of the heritage building which houses the Lobster Cove Lighthouse in Gros Morne National Park in Newfoundland, Canada.